For centuries, small fragrance sachet of dried herbs and flowers have been used to keep clothes and linen smelling sweet and free from moths. All the ingredient in the mixture must be dry before using in the fill. The basic ingredient of fragrance sachet are herbs and flowers plus a selection of spice, dried orange, dried lemon peel, orris root powder and essential oils. Suitable leaves are : alecost, basil, bay, bergamot, hyssop, lemon balm, lemon verbena, various mint, scented geranium, rosemary, tansy, thyme, tarragon. Suitable flowers are : acacia, jasmine, rose, narcissus, carnations, orange blossom, wallflowers, lily of the valley. Because of their strong aroma, spices, citrus peels and roots should be used sparingly in this scented sachets. A proportion about 1 tbsp of ground spice, citrus peel and roots to 50 g of flower and leaves is advised. Suitable spices are : allspice, aniseed, cinnamon, cloves, dill seed, vanilla pods, juniper, nutmeg, ginger, dried peel of citrus fruits, roots of angelica, cowslip, valerian. In order to make homemade sachets longer lasting it is necessary to add fixative powder. Orris root powder is the most popular one. Its sweet violet scent does not strongly affect the aroma of a mixture. 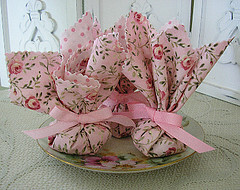 Use about 1 tbsp per 25 g of blended flowers and herbs. 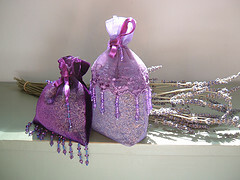 Essential oils are ideal to add strength and depth the fragrance of the sachets. They also can be used to revive an old mixture which has lost its scent. Add only a few drops to each mixture or it will over power the existing fragrance. Make sure all the ingredients are crisply dried before you start. Finely crumble them into a bowl, taking care not to reduce them into dust. Crush the spices and citrus peel and add to the bowl. Add the orris root powder. Mix together well. Add the essential oils. A drop at a time, stirring between each drop. Put the mixture into the polythene bag. Seal the top and leave for six weeks. 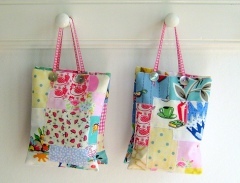 Use the mixture to fill into a sachet bags. Pack the bags fairly loosely to allow the fragrance of the herb mixtures to be easily released. This fresh and spicy mixture is ideal for scenting clothes, sheets,towels and also can be drawer sachets. This sweet rose sachet has a soft, luxurious scent for placing amongst your personal linen and summer clothes. 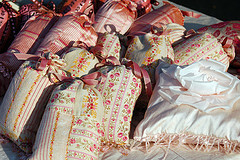 Sewing expert Linda Lee uses alternating colors of silk organza and potpourri to create fragrance sachets. Begin by tearing the silk organza into two square pieces. Tear the metallic silk organza into two smaller squares. Iron the edges of all pieces. Stack the smaller squares onto the larger squares. Use a chalk marker and chalk to draw a vertical line down the center of the smaller silk organza square. Use the chalk marker (figure A) to draw a horizontal line crossing the vertical one. Brush away chalk lines. Tie a knot -- which will become part of the design -- in the end of rayon thread. Handstitch vertical and horizontal lines (figure B) on metallic square. Leave edges unsewn. Fill each of the four pockets that have been created with potpourri (figure C). Tip: Pin the pockets shut after filling to hold them closed while sewing edges. Sew edges closed.